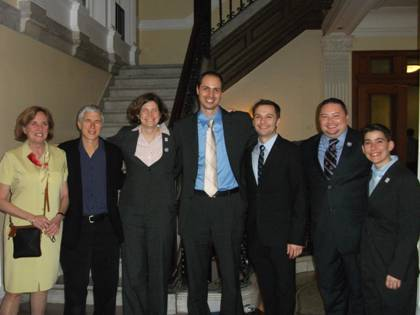 Arline Isaacson, Jennifer Levi, Carly Burton, Gavi Wolfe, Rep. Carl Sciortino, Gunner Scott and Kara Suffredini. Photo by Chris Riley. I am new to tweeting as anyone can tell. Technological neophyte that I am, I committed to learning it, though, because of several recent chances I’ve had to be on the front lines of civil rights advances. I want to be sure that members of our community who can’t leave their obligations to rush to our state capitals get the minute-to-minute updates and details of how the hard work of social justice is unfolding. Still, it had been a wild ride of a day. I defied her suggestion, staying just a few minutes more for final enactment by the Senate. I was sitting with Gavi Wolfe, legal counsel for the ACLU and just behind Ken and Marcia Gerber as well as Liz Monnin-Browder’s mom, when it happened. It was all over - the Transgender Equal Rights Bill had passed. It was headed to the governor’s desk where we know he will enthusiastically sign it. We all left the Senate gallery and walked downstairs to welcome and thank our champions. Senator Chang-Diaz walked out first. She hugged Ken and Marcia Garber and invited all of the supporters to come onto the floor of the Senate to hear some final remarks. Senator Chang Diaz poignantly talked about Ken and Marcia’s son CJ who was transgender and whose life succumbed to the bigotry and hatred of a society that does not yet fully and completely respect the dignity and sanctity of transgender people’s lives. Everyone in the chamber – senators, aides, staff, and clerks – then rose to applaud Ken and Marcia and all the activists and advocates who had put in thousands of hours at the statehouse and beyond to educate legislators and the community, necessary work to get to where we did in final passage of the bill. It was an amazing day. I knew it and could feel it in my heart and exhausted body. Still the victory was bittersweet. The bill we got passed includes essential protections for the community. It includes the hate crimes protections we need to combat violence. It rewrites the laws in the Commonwealth to prohibit discrimination in employment, housing, credit, lending, and in our k-12 public schools to protect our youth. It admits of no exceptions in these areas. Employees are fully protected; students are fully protected; tenants and credit applicants are fully protected. We’d not allowed our opponents to cut out protections for anyone in our community. The bill does NOT require that you meet any particular definition of what it means to be transgender to be protected nor does it exclude any particular spaces within those areas of protection. I feel proud of that. And yet, and yet, the bill is not complete. It is not perfect. It passed without important protections for transgender people in the public sphere. Because too many legislators were not yet ready to deal with the full reality of our lives, the bill came out of the Joint Committee on the Judiciary without public accommodations protections. Contrary to popular belief, public accommodations protections are not solely about bathrooms and locker rooms (which are important, to be sure). Public accommodations refers to any facility – stores, restaurants, movie theatres, malls, for example – that opens itself up to the public for the purpose of providing goods or services. And, like the employment, education, housing, credit, lending, and anti-violence provisions of the bill that passed, the public accommodations provisions are also essential to the community. We fought like hell to keep them in, then hoped against hope that our legislative champions could get them put back in as the bill progressed from House to Senate. They could not. As I made the 2 hour trip west to my home last night in the pouring rain, I kept hearing the refrain from Deuteronomy in my mind over and over and over again. Justice, justice, you must pursue. Justice, justice, you must pursue. Yesterday was a huge victory at the statehouse. It came after years of hard work by many, many, many people and many, many, many organizations. Those of us working together on this issue have become like a family. Sometimes we get along, sometimes we don’t. We agree on a lot of things, and disagree on some. We banded together and forged a strong community to get more rights for the transgender community than we had before yesterday’s historic votes. There is more work to do. I know we are all committed not to rest until that work is complete. Justice, justice, we shall pursue.